I almost typed “The Hitman’s Holiday” because those actors got a pretty good free working vacations, highlighted by London and Amsterdam. But they also shoot up and blow up these two places, which makes it a bit too close to the reality of recent terrorism activities, and probably explains the film’s lackluster release in the dog days of August. Samuel L. Jackson gets full use of his tried-and-true persona, which is fine when you want to cash a paycheck, and want to make sure that you don’t have to work too hard. Ryan Reynolds does his smarmy dude as well, as he cools his heels before the next “Deadpool” movie comes out. It’s not bad, it’s not good, it just is (with a huge dead body count). Michael Bryce (Reynolds) is a Triple AAA rated “executive” bodyguard, who loses that status when a VIP Japanese arms dealer is killed under his watch. Two years later he is down and out, trying to get his rating back and pining for an old flame named Amelia (Elodie Yung), who happens to be an Interpol agent. Amelia’s latest case is a transfer assignment for Darius Kincaid (Jackson), a professional assassin. It turns out Kincaid is the only living witness that can testify against Vladistav Dukhovich (Gary Oldman) – an exiled Russian despot suspected of genocide – at the Hague in the Netherlands. Interpol offers Kincaid an exchange… the freedom of his imprisoned wife Sonia (Salma Hayek) for his cooperation. But he’s going to need a bodyguard to get to the Hague on time, and Michael Bryce happens to be available. Call the Russian “Henchman Union,” they’re going to need a bunch of new recruits. The body count is astounding in this film, and of course Darius the assassin can casually shoot a handgun behind his back and send a Russkie to his Maker. There are uncomfortable shoot outs on public streets, with the hapless citizenry cowering like rats near a dumpster. Oh yeah, and they give real bad guys some good ideas on how to blow up things real good. It’s only a movie, as the old cliché goes, but it occurred to me that casual violence like the type shown in the film becomes more stomach turning with each real incident of violence in our special current times. 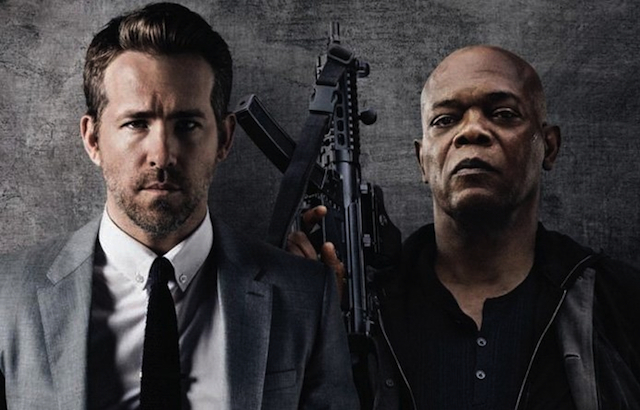 The only-a-movie part is accomplished through the buddy formula, this time pairing the “motha-f**king” Samuel L. with smarmy frat boy Ryan R. It’s a decent match up, I suppose, and fans for both gentleman will probably like their exchange of witticisms. Jackson’s vocal rhythms are so familiar I thought he’d stop and do a credit card commercial during the action sequences, and Ryan is practicing his ironic stand-up routines while dispatching bad guys with his fists and lead pumpers. Also character actor Gary Oldman gets to trot out his Russian accent from “Air Force One,” and always lends a bitterness that all films need. There are some odd and even interesting moments in the film, courtesy of director Patrick Hughes. In the midst of their road trip revelry, each of the buddies relate stories of their past, how they met their ladies and how Darius became an assassin. All these segments have a peculiar style, especially the Darius origin story. It took on a quasi-biblical proportion, with retribution and artistic flights of birds included. Easily these flashbacks could have been cut from the nearly two hour running time, but for some reason they float above the rest of the mayhem. 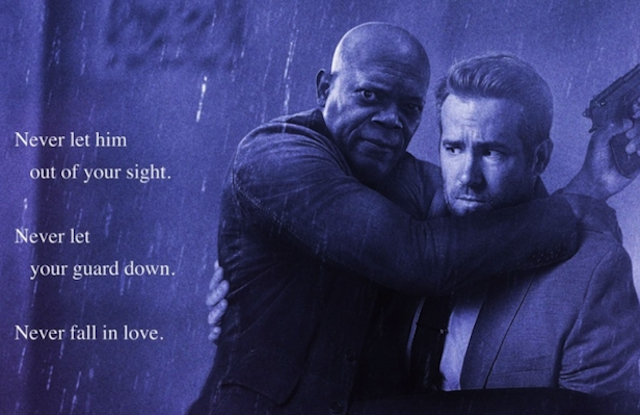 Ryan does some meta-quipping when it comes to Samuel L., how he has taken all impact out of the term ‘mother f**ker.’ Who thought we would live to see that day? In fact, the next time in a bar with professional assassins, I’ll try out the term to see how far it takes me. See you in the next world, mo-fos.